SMS Messages are sent through Twilio by default (our built in provider), or you can choose to buy a Flowroute account and send through your own account. 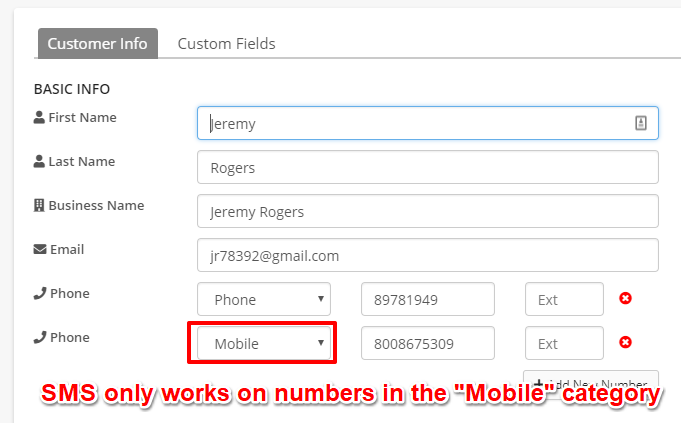 If you use the default setup, it "just works" - and we include some SMS credits for you to use every month. Here is the included quantity with each plan - this is subject to change without notice based on pricing and availability! If you go over or want to buy more credits, head to the addons page inside your account to buy more - we sell addon packages of 2500 credits for our cost. Head to Admin, "Buy Credits/Addons" to see details. The monthly credits above are per calendar month and reset on the first of the month. The Add On credits are used after the monthly credits. While the monthly credits do not roll over, the unused add on credits do roll over until depleted. You can check the SMS credits level on your account in the Consumables Usage Report located in the Admin area. Important: If a customer has more than one ticket open (Not Resolved) the SMS may not make it back to the correct ticket. If SMS is enabled, the Initial Problem SMS will be sent upon ticket creation. SMS will not be enabled unless there is a phone number that is categorized as a "mobile" phone on the customer record. Note that you do need to include the message in both the email and the SMS field for it to be sent in these cases. If you'd like to customize the SMS messages sent with ticket update triggers, go to Admin > PDF/Email Templates > SMS Templates. Important: Furthermore, if a customer has more than one open ticket at a time, we cannot guarantee that the SMS customer reply will attach to the proper ticket. Note: Messages exceeding 144 characters can be sent to the Customer, though they will be split up by the system into multiple messages.